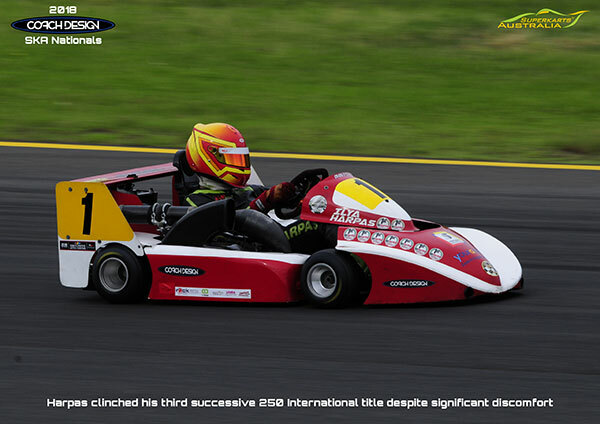 Summery conditions greeted the competitors at Round 2 of the Coach Design SKA Nationals held on November 3rd and 4th at Sydney Motorsport Park. 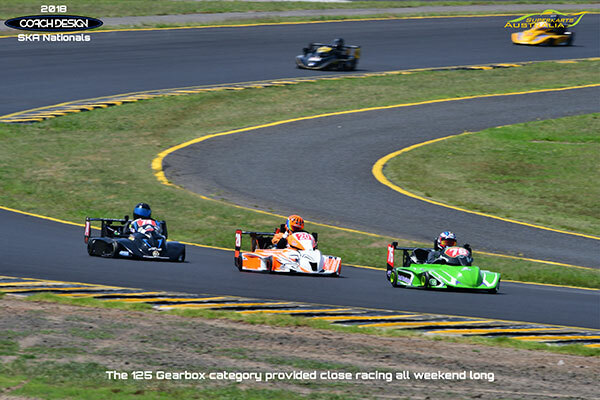 Superkarts Australia shared headlines with the Formula Vee nationals providing close and exciting racing throughout the warm weekend. As always qualifying was a competitive affair, the lure of driving flat out at one of the better racetracks in Australia bringing out the best in the drivers. Qualifying was hot and windy, with a cross wind blowing on the main straight meaning competitors would be trying all sorts of driving techniques and vehicle setups to minimise drag down the straight. The 15-minute session allowed most drivers to do six laps of the circuit with reigning champion Ilya Harpas claiming a deserved pole from series leader Gary Pegoraro second fastest. Reigning 250 National European Champion Jordie Ford was the fastest in the 250 National class (6th overall) while Aaron Cogger claimed pole for the 125cc brigade with a credible 11th outright. The field was set for what would be a 4-race format, and with points accumulating to claim the eventual winner it would be a true test of speed and durability. As race 1 commenced both Pegoraro and Harpas made a fast start and toured the turn 1 and 2 complex side by side, with Ryan Urban and Anton Stevens following just behind the leading pair. At the back of the field the race of attrition was in full swing with Jordan Ford and WA visitor Mark Hanson retiring during the first lap. As the race matured Harpas showed his speed and started pulling away from Pegoraro, the dicing pair of Urban and Stevens crept closer to the second placed driver. By midrace Harpas was in full control from what had evolved into a two-way battle between Urban and Pegoraro. 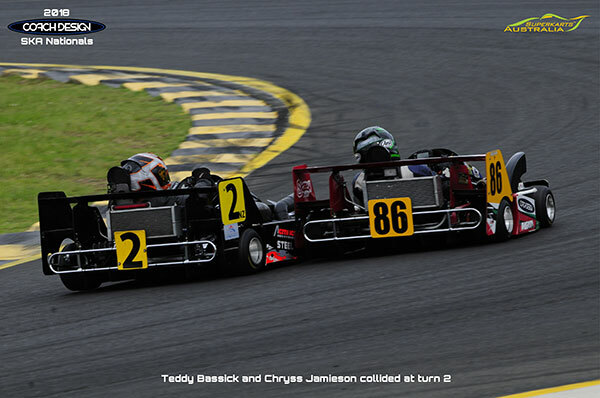 Teddy Bassick and Chryss Jamieson diced for position during the early part of the race until their unfortunate touch at turn 2. Bassick made a lunge down the inside of Jamieson but made contact, sending Jamieson into a spin and leaving him stranded in the middle of the track with nowhere to go and watching from the sidelines. In the end Harpas won comfortably from a distant Urban who in turn edged out the fading Pegoraro for 3rd outright. In the 250 National category it was Laurie Fooks who took his first victory of the series from Josh Miller and Tony Moit. Pole sitter Jordie Ford was unfortunately out on lap one with more bad luck striking the young Victorian this series. Aaron Cogger took victory in the 125 Gearbox class whilst series leader Paul Campbell suffered mechanical dramas on lap 1 with steam bellowing from his engine coming around corporate hill. Fortunately for him he was able to re-join the race to finish in 5th, albeit one lap down on his championship rivals. Brad Stabbing finished strongly in second to do his championship hopes no harm with Nicholas Schembri finishing third on debut. 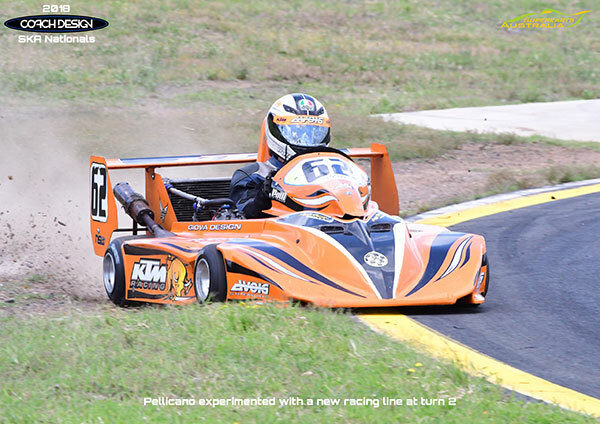 Race 2 was held on Sunday morning in slightly cooler conditions. The start mirrored the first race with Harpas and Pegoraro making an early break and leaving the rest of the field in their wake. By the second tour of the circuit Harpas showed his class and was pulling away from Pegoraro, whilst Urban had his hands full in third position with Kristian Stebbing piling on the pressure. 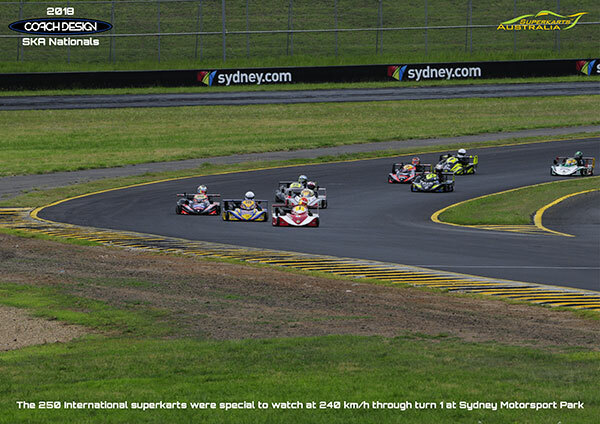 Further back battle packs were forming up and down the field as are normally the case in great Superkart races. John Pellicano overshot at turn 2, touring in the grassy outfield for what seemed like an eternity, eventually re-joining, albeit losing many positions. He was not the only one to get the corner wrong with John Dunn also spinning and eventually retiring. Anton Stevens lost all power heading into turn 3, putting his hand up to signal fellow competitors that his race was done. Up front Harpas won again from the hard charging Pegoraro who had picked up 2nd after New Zealander Urban made an error coming onto the straight for the final time, luckily the latter recovered to finish 3rd. In the 250 National category Laurie Fooks was in fine form, taking the honours once again from Tony Moit and John Pellicano. Series leader John Dunn continued to suffer mechanical dramas, as did young gun Jordie Ford who had been suffering with electrical issues during the weekend. 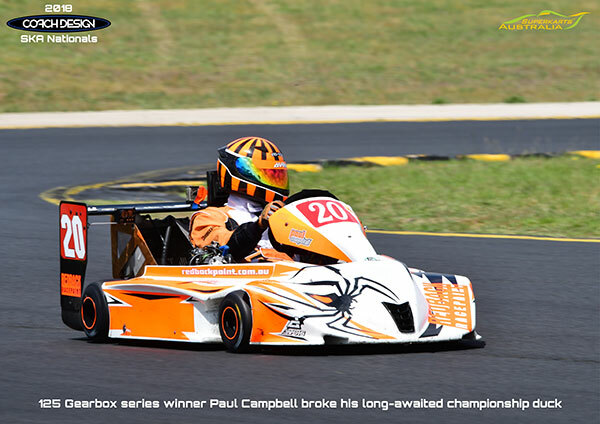 The 125 Gearbox category was won by Aaron Cogger from a cautious series leader Paul Campbell and youngster Nick Schembri who continued to impress in his debut SKA Nationals series. Race 3 would be a battle of attrition with 11 drivers running into trouble and not finishing the race. Harpas made an unusual tardy start allowing Pegoraro to make the early running with the charging Urban shadowing the pair. Unfortunately, the fast Kiwi hit engine troubles and toured into the pits for a disappointing DNF. Following this on lap 2 Harpas made a decisive move on Pegoraro for the lead and never looked back. 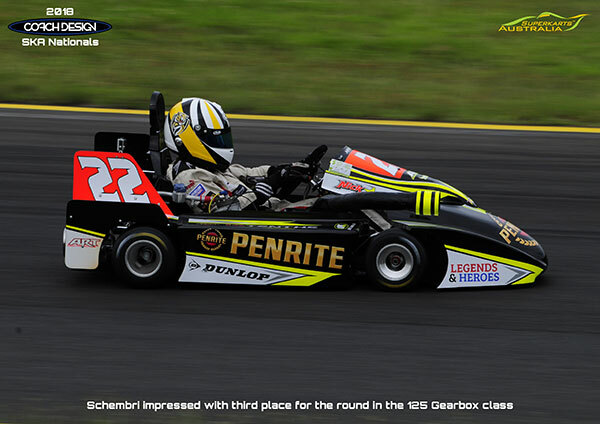 Nicholas Schembri and Mark Robin provided the best dice of the race with both drivers swapping positions repeatedly. Kristian Stebbing was running as high as third when his kart lost all power just before turn 2, leaving him to watch the rest of the race next to the marshal’s post wondering what could have been. In the end Harpas won by a comfortable 10 second margin from Pegoraro, the consistent Jamieson arriving home in third. In the 250 Nationals it was a race of attrition with John Dunn taking the spoils following Laurie Fooks’ loss of radiator fluid. Tony Moit struck troubles allowing John Dunn to move one point ahead of Tony Moit in the championship with only one race left to run. In the 125 Gearbox category Paul Campbell and Lee Vella fought head-to-head for much of the race with Lee Vella taking the spoils. Aaron Cogger took the final podium place in what was turning out to be a resurgent weekend for the original “Rat Pack” member. The final and most important race was run late Sunday afternoon and as before it would be a Harpas/Pegoraro show with both drivers showing speed and skill and most importantly courage. Pegoraro made the better start with Harpas shadowing him early on. 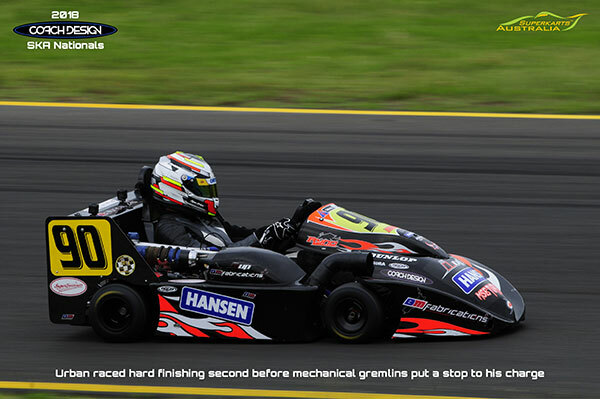 Urban was in third position but his glory did not last long with his kart failing again. Harpas overtook Pegoraro to take the lead and controlled the race until disaster struck the young South Australian. Damage to his front exhaust saw hot exhaust gases spill onto his leg, resulting in a loss of power and most worryingly burns to his leg. Knowing that he had a points advantage over Pegoraro he pressed on despite the relentless pain. He lost the lead and subsequently was passed by Jamieson to finish a brave 3rd. This allowed enough points to claim his third successive SKA Nationals title over Pegoraro who was a determined winner of the final race despite the physical conditions. It was a consistent Jamieson who was awarded with a well-deserved 2nd ahead of Kristian Stebbing who claimed third place in the series. Teddy Bassick was the surprise package of the weekend, recording consistent top six results to take home third place for the weekend. Despite finishing SKA Nationals runner-up for the second year in a row, Gary Pegoraro can take pride in achieving a clean-sweep of the podium places as an engine builder with “Wizzer Engines” finishing 1st, 2nd and 3rd for the second year running in the 250 International category. Wizzer Engines have been responsible for the last three SKA Nationals titles, as well as four titles in the last five years – a record that would be mighty impressive in any motorsport discipline. 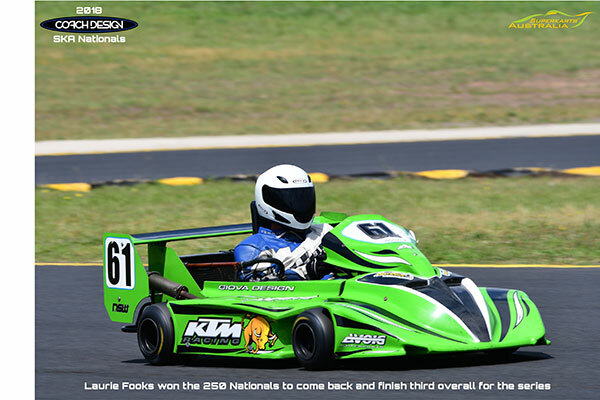 The 250 National category saw Laurie Fooks return to winning ways ahead of Tony Moit and John Pellicano in third. Fooks’ bad luck at Phillip Island was somewhat reversed as he overhauled unlucky young gun Jordie Ford for third place overall in the standings with this result. With John Dunn unable to make the start of the final race Moit’s second place finish was enough to overhaul a 1-point deficit to Dunn and claim the 250 National SKA Nationals title for 2018. The 125 Gearbox category provided a fantastic spectacle in the final race with Lee Vella and Aaron Cogger battling all the way to the chequered flag, Vella wining in a photo finish. Paul Campbell was content to sit back in third place and collect vital points for the championship having finished runner-up on too many occasions for his liking. The final points tally for the weekend round saw Cogger take the overall victory from Campbell and impressive youngster Nick Schembri. 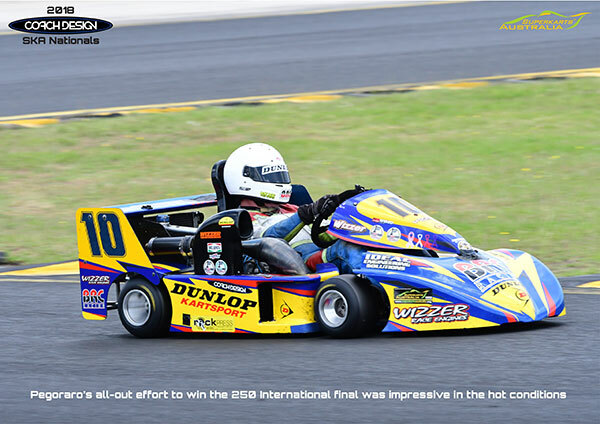 It was a hot, physical weekend of racing at the SKA Nationals at Sydney Motorsport Park and Superkarts Australia congratulates all the competitors who took part and everyone who made the event possible. A special mention must go to the New Zealand competitors who made the journey across the Tasman and enriched the successful event with their presence.